A nor'easter is on the way for our Monday morning, perhaps one of the heaviest snowfalls of the entire, so-called, winter 2015/16. How much snow for real though? It is amazing how much attention has been paid to that question over the last seven days. It is the number one topic of discussion everywhere we go today, church, the St. Patrick’s Day parade, the transfer station, the pizza place. We all want to know exactly how much snow, oh yeah...and exactly what time does it start? And exactly what time does it stop? The forecast has been zigging and zagging, and will probably zig and zag again as the snow finally arrives in the middle of tonight. One of the funny things is: this storm did not even exist as the sun came up this morning, on our first day of spring. If we get 5 inches of snow in Boston that will match about 20% of the entire seasonal snowfall (25.9") so far, bringing us to more than 30 inches for this winter. And that is about what we expect: 5-6 inches of snow - possibly a little bit more - in the Boston area during our Monday morning commute. We're watching a upper-level low over Tennessee, a stalled weather front in Pennsylvania and New Jersey, some showers and thunderstorms off of North Carolina, and a blossoming area of rain over the Bahamas. Bits of each of these energy centers are joining together in the sky as we go to bed. This atmospheric brew yields a weak to moderate nor'easter, positioned southeast of Nantucket at sunrise on Monday morning. The storm is forecast to strengthen rapidly as it progresses into the Canadian Maritime provinces by Sunset on Monday. It is not exactly what we call 'bombing out,’ but it is a formidable storm as it moves away. The net result is a period, or periods of, moderate to heavy snow for southern and eastern New England from roughly midnight through noon time. Snowfall rates may reach 1 inch per hour for a few hours, especially early in the day. And even though the snow may not shut off until early afternoon from Boston to Portland Maine, the high angle of the March sun should result in snow melting on impact with roads by that time. But the cold the roads of sunrise will necessitate road crews with treatment, and plows through mid-morning at least. Generally speaking it looks like a 3 to 6 inch snowfall. If it were midwinter with shorter days and colder air, you could easily be closer to 8 to 12 inches. The liquid equivalent of this storm is going to be roughly 1/2 to 1 inch of H2O. The greatest liquid equivalent of this storm is likely southeastern Massachusetts, but we are not increasing snow totals here due to warmer air, and perhaps quite a bit of sleet and rain mixed on parts of Cape Cod and The Islands. 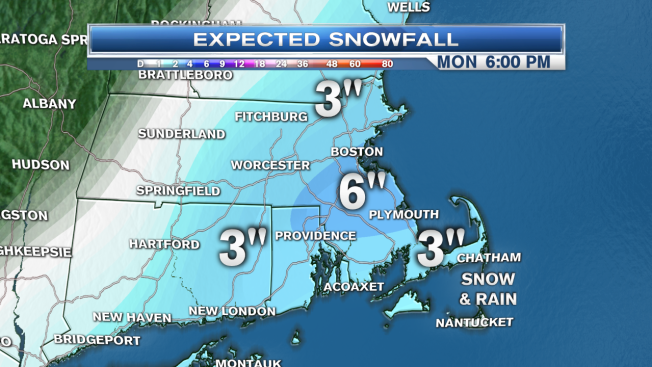 If it stays all snow on Cape Cod there would be potential for 10+ inches. But for most of the region, where it is all snow, this translates to a ratio of about 6 or 7 parts snow to one inch of water. This much dense snowfall can weigh down tree branches and result in scattered power outages in eastern New England. Wind may gust past 35 mph on Cape Cod in the islands, and far Eastern Maine, but for most of us, the wind is not an issue. In fact a lack of wind away from the shore may result in more power outages, as the snow is more able to stack up on tree branches because the branches are not moving around. The lack of storm or even gale force wind is good news at the coast, where we are not expecting any flooding, just some minor to moderate erosion at the late morning high tide. In Western New England the sun is out tomorrow with high temperatures near 40°, or even warmer. In areas that do snow, we should have a few hours of sunshine during the evening commute, resulting in wet, or even partially dry roadways by that time. This formula is not etched in stone. We will be all hands on deck here at NECN tonight and tomorrow with the latest on the zigging and zagging our spring Nor'easter. Just about all the snow will have melted by Wednesday when temperatures are back to 50 degrees. Later in the week the weather plot does thicken a little as a front separating very cold air in Canada, and warmth to record warm in the eastern United States, with the boundary right over New England. We may end up with some snow in our mountains, maybe even some icing, but we will deal with that after this first nor'easter of spring 2016.